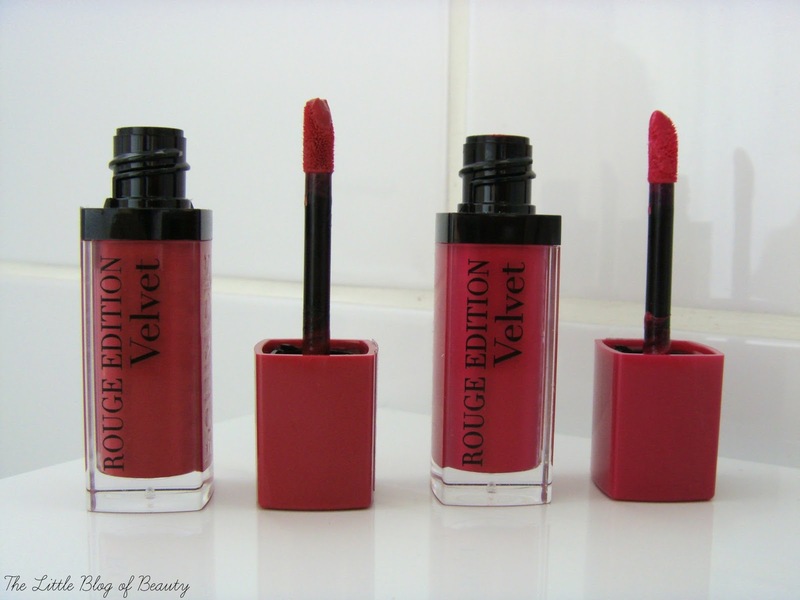 Even though I was super excited about the Bourjois Rouge Edition Velvet lipsticks when I first saw the promotional images for them I didn't actually get round to buying my first one until a couple of months ago. Maybe because they seemed to take so long to come out I got a little bored and kind of forgot about them. Does anybody else find it frustrating when a brand releases images of a product but then reveals they're not releasing it for another couple of months? The first shade I bought was Ole Flamingo! and a couple of weeks ago I also bought Frambourjoise. Apologises that my pictures aren't great. My poor old camera couldn't cope with the packaging and similar colours very well. Packaging wise these come in quite short see-through glass tubes with plastic lids that are coloured to correspond with the colour of the lipstick. Inside you'll find a typical fluffy doe foot type applicator. There's a slight artificial type smell to them but this is nothing to worry about as you can't smell this once applied and I haven't noticed any kind of taste either. 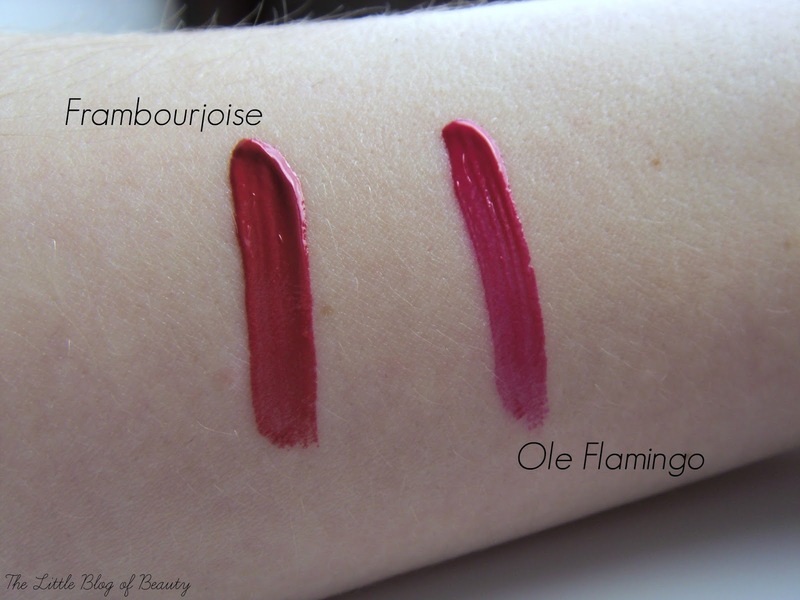 Shade wise I'd describe Frambourjoise as a deepish red (described by Bourjois as a red berry with a pink undertone) and Ole Flamingo! as a darkish pink (described by bourjois a deep pink with the spirit of raspberry). I actually find these a little difficult to apply, which I find quite strange as I don't think I've seen anybody else mention this in any of the reviews I've read so far. 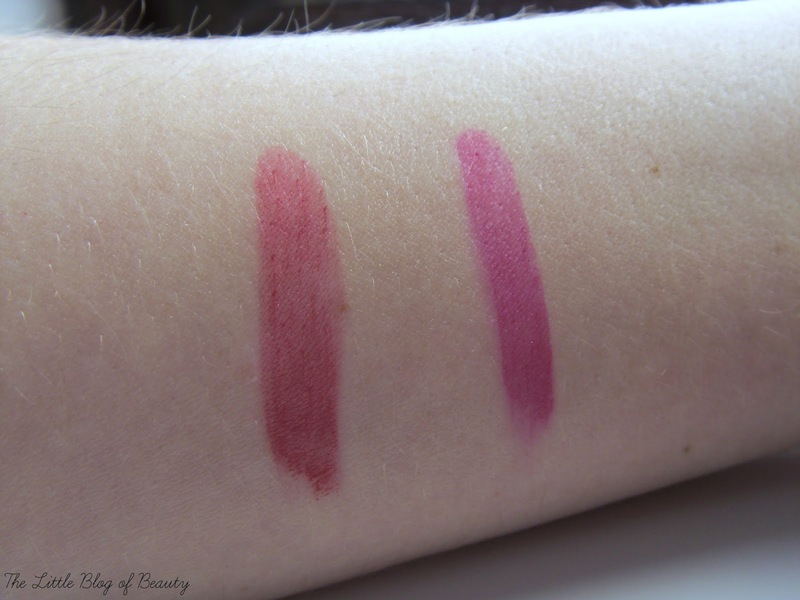 To begin with I find they apply a little patchy and my lips appear to absorb most of the lipstick, so although there is a little bit of colour on my lips it's not very impressive, more a a slight stain. However I then apply another layer over the top and with the first layer acting as a base this is then perfect. Despite my issues with application there's a couple of things I love about these. As the name suggests these have a velvet finish, so they're not fully matte but they're not glossy either. 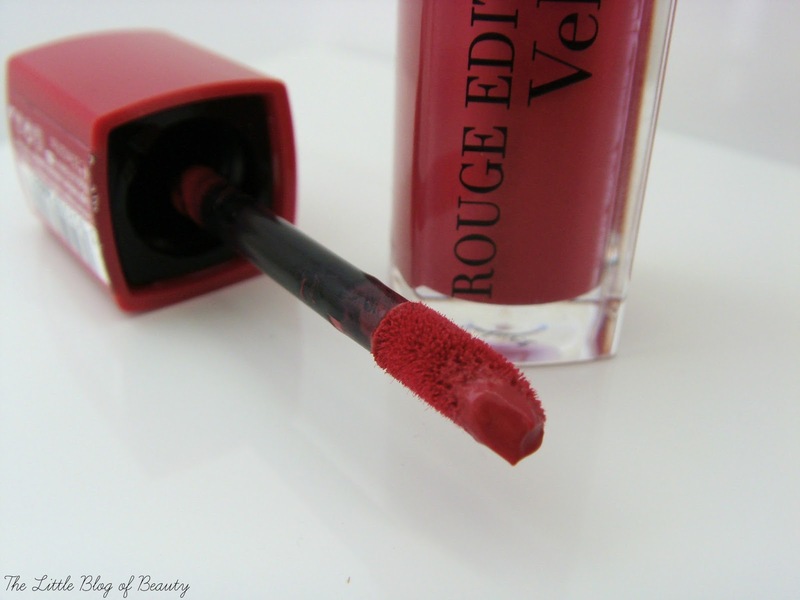 As you may have heard me mention before my naturally dry lips don't like full on matte formulas at all, I find them very drying and uncomfortable, so a velvet formula is a great compromise for me if I don't want a glossy lip colour. These have a very light formula and when first applied you can barely feel that you have anything on your lips. Once these have dried down to the velvet finish I do find that they become very slightly tacky, but not in an annoying, uncomfortable sticking your lips together type way. It's definitely something I can live with and wear comfortably. The absolute best thing about these though is once they're on, they're staying on! They just do not shift until you decide it's time to take it off. A few days ago I applied Frambourjoise at about 11am. This went through a substantial sushi and noodles meal (which was very delicious) and a nap and when I came to remove it at about 7:30pm it was still pretty much perfect. Yes it had faded, the velvet finish wasn't there anymore, but once this has worn off you're left with an amazing stain (that you can see in the last of the pictures above) that is still perfectly presentable without having to touch up. The stains you can see on the picture above were what was left after I'd applied the swatches, taken the picture and then wiped the lipstick off my arm. These stains were still slightly visible on my arm 24 hours later (I promise I do wash, they just managed to survive through a shower). Despite the staying power they do remove quite easily with a cleansing oil, although if like me you naturally have lines on your lips this might still be there in the lines in the morning if you don't smile to smooth them out when cleansing. So despite my slight issue with application I do actually love these and keep having to stop myself picking up at least one more in Boots current 3 for 2 on Bourjois. For £8.99 each you really can't go wrong with these. 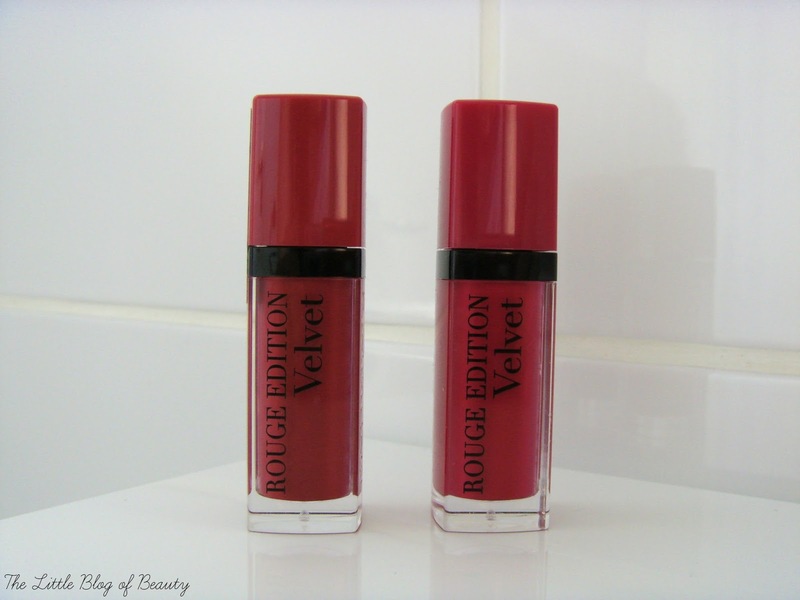 Are you a fan of the Bourjois Rouge Edition Velvets?